If you plan to buy transplants from M R Gardens this year, please be sure to take advantage of the Pre-season Prep service, as I can't guarantee that all varieties will be available unless you order them ahead of time. Plants should be ready for you to transplant into your garden prior to Mother's Day—the exact date varies each year depending on the weather. The order deadline is Monday, March 18, and if you haven't received your plant list yet, please email gardens@wncmretc.com or call me at 828.333.4151. 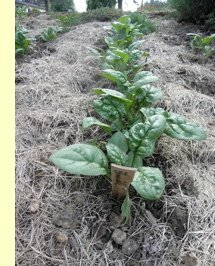 Read more about the service in last week's newsletter and see descriptions and photos of a few of the heirloom peppers and tomatoes on my website. Not having much luck with direct seeding? If your answer is "yes"—don't worry, you're not alone. I've heard frequent concerns about direct seeding, which is when seeds are planted straight into the soil as opposed to using starts from a nursery. An afternoon of garden coaching might help. Successful direct seeding requires thought, preparation and precision. Each crop has its own requirements for seed depth, spacing, temperature and moisture. 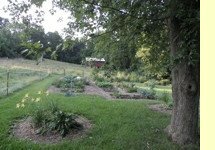 And, as with everything in gardening, your success depends on the quality of your soil, which can be improved with proper organic techniques. From now until June 14, I've dropped the low end of my sliding scale to $12 an hour for customers seeking tutorials on direct seeding. Some seeds may be included in the price depending on which crops you request. If you want to plant spring crops such as mixed salad, other greens, peas, potatoes, bunching onions, cilantro, parsnips, turnips, or radishes, please make an appointment prior to April 15. Some frost-hardy crops such as carrots and beets sprout more quickly when the soil has warmed to 70F, so we can wait until late April or later to seed them. For summer crops such as squash, cucumbers, melons, beans, okra, sweet corn and popcorn, we can make an appointment to seed between May 13 and June 14. Please contact me at 828.333.4151 or gardens@wncmretc.com. You may be wondering, is it better to sow seeds directly into the soil and or is it better to transplant seedlings? While a lot of crops dictate the answer to this question (for instance, you'd only direct seed a carrot and only transplant a pepper), you have a choice with some crops such as greens, most culinary herbs, many beneficial flowers and Cucuberits (the squash, melon, and cucumber family). They typically do just as well either way—although Cucuberits can be finicky transplanters. There are pros and cons to transplanting from both a sustainability standpoint and a plant quality standpoint. My growing style has been greatly influenced by a couple of my early farmer-teachers who were trained in Ecology Action's Grow Biointensive method. Students of the Biointensive method transplant most crops—even beets!—in part to save space in the garden. Read the rest of the article on my website. I just added one more reason to my growing list of reasons why I garden: After a hard day's work, I love to sit on my deck and admire the work I completed. In conversations with you, I realized I am not alone! This is something gardeners share in common. What other reasons do you garden? I'd love to hear from you on my page: https://www.facebook.com/mretcetera.gardens. Want to get rid of your pots from last season? Click here to read about my divese background in horticulture, sustainable agriculture and experiential education. I will gladly reuse your trays, 4-cell containers, and 3-in., 4-in. and 5-in. pots. Please be sure to wash them with dishwashing soap thoroughly before you give them to me. This pre-wash decreases time spent sanitizing the containers and ensures that plant disease does not spread to my nursery. I greatly appreciate you helping to keep down labor costs associated with washing pots so that I can continue to offer a sliding scale. Contact me at gardens@wncmretc.com to let me know what sizes of pots you have. patch with a division from hers four years ago, and I want to continue to pass on the love. If you'd like free crowns, please let me know right away as I'll be thinning out my patch next week. You'll need to plant them as soon as you get them (or pot them in containers until you can plant them) or they will dry out.